"How wonderful the colour yellow is. It stands for the sun." I would never choose yellow as one of my favourite colours. However, I've been admiring it lately. Feverfew, seen above, seeds itself wantonly in my garden, and I let it grow where there are empty spots. The unwanted plants are easy enough to yank out. Some of my plants are single-flowered, others are double. Aren't they pretty? Yellow, combined with white, is sunny and fresh. My neighbour has a few daisies that have crept across the strip of land between our gardens, cheerful open flowers that hide nothing. My mother recently gave me two plates and two bowls of J & G Meakin ironstone ware that belonged to her mother, the grandmother I never met. Mom told me that when she was about 12 years old, she and her father went to Mission, BC to buy a set of these dishes, a breakfast set, as a gift for Mother's Day for her mother. These are all that's left of the set, given at least 70 years ago. They are a pale creamy yellow with a floral pattern. A simple vase of uncomplicated feverfew flowers complements these dishes well. "Yellow is capable of charming God." There is little yellow in my garden, yet when I went looking for it, I found more than I thought. A stray poppy plant growing under the jasmine, the center of a late blooming strawberry, a zucchini squash flower, and many tomato blossoms. The marigolds I plant to deter insects and they are a cheery sight at the end of one vegetable bed. Where do you stand on the colour yellow? Love it, hate it, ambivalent, or somewhere else on the spectrum? No yellow here, but a salad we enjoyed this week. Freshly picked and washed lettuce, diced avocado, strawberries from the garden, blue cheese, and a drizzle of balsamic reduction. Delicious! As I write this, on Sunday evening, a flash at the window startled me, followed by the long rumble of thunder. We rarely get thunderstorms here, and I find them exciting. There's a bit of rain falling, most welcome on our already dry lawns and gardens. I hope you've all found out about the fix for Blogger comments going to emails. Another blogger emailed me to let me know, and I've seen the solution elsewhere. Here's a link to the simple fix. To me yellow is a no no, allowed only in the spring :) But your photos and mosaics are really beautiful! Lovely photos Lorrie - the mosaics are beautiful! We had feverfew in our garden for years then last year it disappeared, I've no idea why. As with yours some single flowers some double. I love the color yellow! My walls in my living room, kitchen and dining room are a color of yellow called Belgium Waffle. That salad looks wonderful. Oh! That's feverfew. I've got it in the parking lot gardens and I've been enjoying it. I recently discovered a sunny yellow t-shirt among my little worn clothing. I've started to wear it around and have received compliments. I think that it might work with a tan, probably not in darker days. Your salad looks lovely! Beautiful collages you have made, Lorrie. They look so bright and cheerful... just like the color yellow looks to me. I had yellow walls in much of my house and always thought it was a happy color. Next time I'm out in the garden I'm going to pay closer attention to how much yellow is out there. Dear Lorrie, Yellow was never allowed in my garden because my house is yellow. 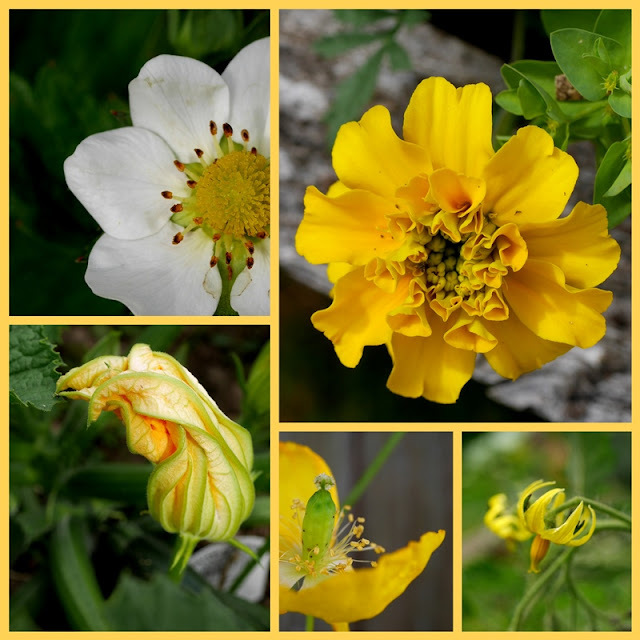 I have recently changed my mind because I have noticed that a bit of yellow brightens every flower bed and every flower bouquet. I have masses of daisies blooming everywhere on our property. A long time a go I was told that if one keeps the daisy heads whole and scatters them, that is where the daisies will grow. It worked. You have captured the simple shape of feverfew beautifully. I’ve grown to love yellow over the years, having never cared for it at all in my youth! I have feverfew too, and think it’s sweet. Your photos are lovely! I love yellow in my garden and sunflowers are one of my most favorite flowers, along with daisies. Even though I currently don't have much yellow in my home, sunny yellow rooms make me smile, especially when you add some blue transfer ware china. I never wear yellow anything (solid, maybe in some prints). Such stunning photos and collages, Lorrie! The only yellow flowers in my garden are the hundreds of daffodils that herald spring each year but after seeing your wonderful mosaic that could change! Thank you so much for telling us how to fix the blogger/email prob. all is now well here! Oh, enjoy the rain! We need more, and I woke to a bit of drizzle this morning. Sadly, that was it. Thanks for sharing this sunny post! I love the color yellow! I love yellow! It is such a happy color. I enjoyed your story about the J & G Meakin ironstone ware ... what stories it could tell! I love salads with strawberries and blue cheese (or Feta). Have a fun week. Yellow is a sunny cheerful color but it's not in my color wheel to wear ! heehee! I bought cherries at the store this morning and just had some on top of yogurt. It's HOT here but we've had a few showers to help keep things green. Enjoy your afternoon! Hugs! First that salad looks so delicious! Love the two plates too. What a treasure. Yellow was always my favorite color growing up as no one liked it and all the girls only liked pink. Now yellow and pink are about equal for me, though I prefer pink in the garden. We did plant alot of marigolds this year though and they are cheery to see in the garden. I do have a favorite rose that is yellow and orange striped, plus some soft yellow roses too. Plenty of daisies are growing in the garden too. I guess I must still like yellow. Lovely mosaic. That thunder was really something else. We had some down here, too. I'm on Team Yellow. Love it! Thank you for sharing the Blogger comment e-mail notification fix. I agree that tea tastes best in pretty china. 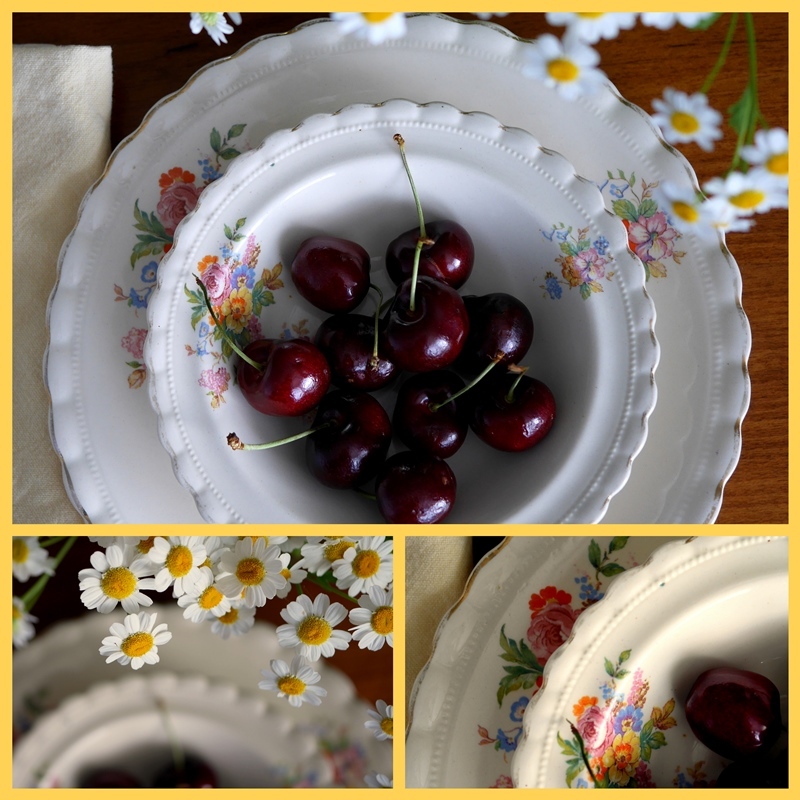 The heirloom dishes that belonged to your grandmother are lovely. Your grandmother's dishes are beautiful! They remind me of the Grindley platters I collect. Alexandra Stoddard says to have something yellow in every room to give it life and I think it works, except when it doesn't. But in the garden who can resist a little of it even if it's the yellow in your daisies. I began trying to keep it out of our garden terrace area, using purples, blues and pinks but then I fell in love with pictures of huge canna leaves and we're trying 3 urns of them for the foliage but with yellow blooms. We'll see how we like them. I had a very yellow kitchen and family room for 12 years, now here we are with a kitchen that was pale yellow when we moved in, and still is. Beautiful salad! Going to go make one now for supper. Wish our lettuce was homegrown! I love yellow, it is such a cheerful colour. Your photographs and mosaics are lovely. Yum! Your salad looks delicious. Such a pretty and cheerful colour! I like yellow! Your pics are lovely. I love yellow color. They look bright and beautiful! I find myself more drawn to yellow lately than I ever have been. Lovely story about the dishes, they must mean so much to you. Hugs. I love yellow, especially in a garden … bright, cheerful, attracts butterflies - what's not to like? I do have a few yellow clothing items, which I tend to wear for Easter. It just tends to attract dirt (it's not me!) and so I haven't bought more. Your mosaics are always so well put-together - so professional-looking - you are my inspiration! By the way, I may not be commenting as often for the next few weeks since I will have my in-laws visiting from the UK. We are going to have a great time! Lorrie, I like yellow and love it paired with navy blue. The flowers are lovely and the dishes are really nice. I have had cherries this week as well. Have a great week Sylvia Durocher. First of all, thank you so much for helping me fix my email notifications. It's funny how one tends to think this is an isolated problem or, if others have the same issue, it will get fixed by blogger. I am happy to have it fixed now. I like the color yellow because it's sunny. I chose yelow roses for my bridal bouquet. Later in life I was told that I'm a winter person and should not wear yellow ... so I'm nervously careful with the tones theres... but I still love yellow flowers! I really like the color yellow. I used to have my bedroom painted in a light buttery yellow color and it was so calm and soothing. Lorrie, I find yellow a very happy colour although I can only wear certain shades of it. I love daffodils, tulips, roses, and pansies as well as daisies. 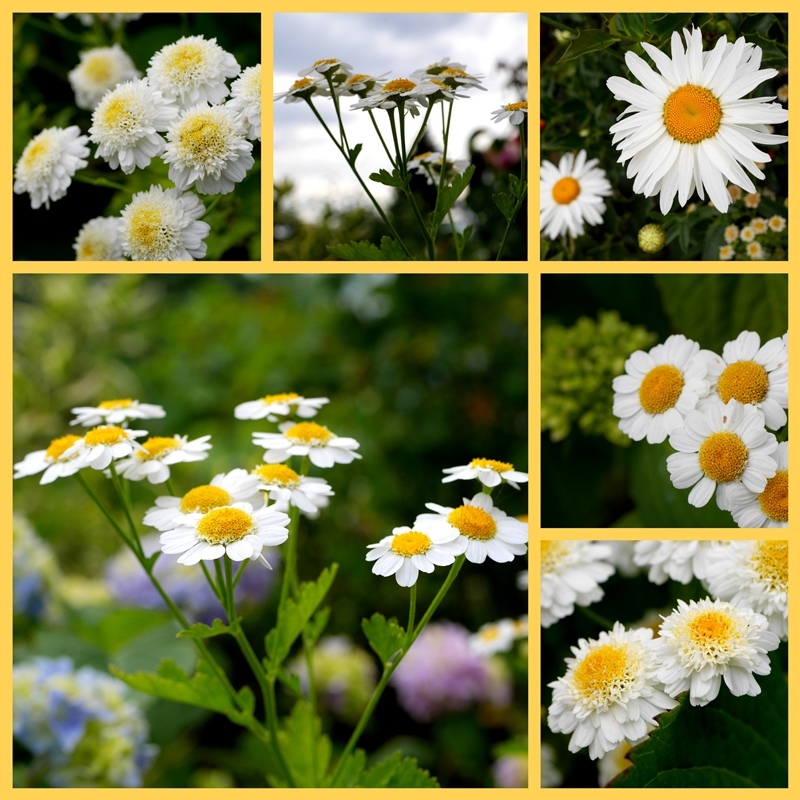 The feverfew is a flower I like but I never knew the name of it. It is very pretty also. I have pale yellow on our bedroom walls because it is the background in the floral bedpread and drapes. I chose that colour because it is on the north side of the house and rarely gets any sun, only in the evening. So nice of you to stop by. Happy Canada Day, my friend! I never clued in that yellow was a favourite colour until I started seeing it everywhere in my house. Yellow is a cheery colour and that's why I wanted yellow on most of my walls -- to keep rooms cheery even in the deep of winter. I never wear yellow (maybe I would surprise myself if I did). Your salad looks so delicious, especially with the balsamic reduction drizzled over top. I've always loved yellow - it's so warm and happy. The daisies are wonderful and the salad is so pretty and looks delicious, too!